For beginners who don’t want to break the bank, the AmazonBasics tripod is a great one to start out with. The AmazonBasics 60-inch Lightweight Tripod is quite possibly the best mid-weight tripod for those who value a budget price over everything else. Following suit with the rest of the AmazonBasics line, the tripod checks most boxes for a basic tripod when it comes to functionality. 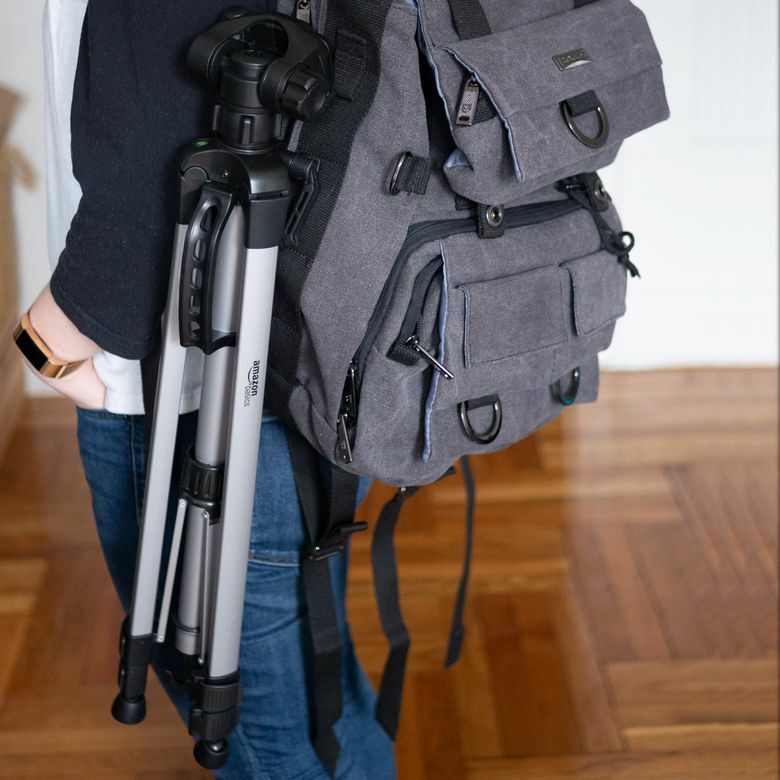 While it doesn’t fold up quite as small as the units advertised as “travel tripods,” it is surprisingly light and easy to carry. What’s more, it provides a lot of handles and grips you don’t often find even on some modern, premium options out there. The AmazonBasics tripod isn’t without its drawbacks, but for the price, it’s hard to find much better. The look of the AmazonBasics tripod is, well, basic. It doesn’t sport any of the two-tone, color-accented looks you’ll find at higher-end models from Vanguard, Manfrotto, or the like. Instead, it’s designed with a simple, silver brushed aluminum body and solid black accents. This actually gives it a bit of a retro look, which might work in its advantage if you’re not looking for something flashy or sporty looking. The flat, slightly contoured legs are actually a little nicer, in our opinion, than the tubular legs you’ll find on most slicker tripods. Amazon clearly put a focus on functionality, so the overall design elements are subtle and stay out of the way. We had our doubts about the AmazonBasics tripod—considering this unit sits so far down in the budget category, we assumed it wouldn’t be very good. We ended up being pleasantly surprised with our experience during both setup and usage. First, to snap the three legs out, you just pull them and then the cross-bracings automatically slides horizontally to form that classic three-leg layout. We found the movement and adjustments to be surprisingly easy and fluid. If you adjust the twistable barrel in the middle, it locks these cross-bracings into place giving you a firm pyramid. Each leg also has two adjustable, telescoping extensions that come out with clasps. This gives the tripod quite a bit of height. It’s billed at the mid-to-high-end at 60 inches, with the center pole fully extended. This really is the most affordable, solid tripod for the price. The part you affix your camera to also offers a few helpful adjustment fixtures. First, there’s the classic pole grip guide that’s aimed more at videographers. Twist this handle to loosen and tighten the Y-axis adjustment of the camera. There’s a small wingnut closer to the stand’s top that lets you loosen and tighten the X-axis, giving you a solid range of motion. There’s even a level built into the top to ensure that you’re shooting from a flat, stable service—a nice addition to the entry-level unit. An articulating plate on the top the allows you to adjust the Y-axis even more dramatically. We found that this was mostly great from a panning and control perspective, but you won’t get the seamless range of motion you’d get from a ball head. Amazon calls the AmazonBasics tripod a “lightweight aluminum” model, not as a travel tripod. That’s mostly because, at a folded length of 25 inches, it’s a good 5 or 6 inches longer than many of the leading compact tripods. That makes a huge difference when you’re considering strapping it to your travel or photography bag. On the plus side, at 3 pounds the tripod is light enough to not weigh you down. What’s so surprising about that is just how big and substantial it is in form factor. There are some trade-offs here with build quality, that we’ll get to in the next section, but 3 pounds is still lighter than the travel-oriented tripods from larger brands. One of the corners that get cut for an affordable tripod is build quality. While many costlier tripods like the Manfrotto Befree and Vanguard VEO 265AB are built out of thick aluminum, with more substantial clasps, or even carbon fiber, AmazonBasics skimps a bit on the material. Here, you’ll find a thinner, rougher aluminum and cheap-feeling plastic on all the fixtures and components. We tested ours for a few shots with a fairly standard DSLR and a series of prime lenses (a Nikon D3100). Overall, whether it was outdoors taking city shots of NYC or indoors doing studio product shots, the tripod held up and felt sturdy. The rubber feet felt particularly stable. Amazon advertises a max weight of 6.6 pounds, which should cover you for a lot of cameras, but we can’t help but worry about the lifespan of this tripod if you plan to put really heavy telephoto lenses or dedicated video cameras on it The plastic plate the holds the camera is of particular concern, so if you’re a busy working photographer, the build quality here just might not be up to snuff. The AmazonBasics tripod comes with a thin canvas bag with a basic zipper and a small strap. It isn’t quite the professional quality of options from more well-known brands, but for the price, we were pleasantly surprised to see it. There is a removable plate for the camera attachment itself, with a hook in the center for attaching a rock bag underneath for further stability. Interested in reading more? Take a look at our selection of the best camera accessories. Dollar for dollar, the AmazonBasics is the best deal you can find on a tripod—at least one that you can trust to hold your camera. The build quality constitutes some concern from a durability standpoint, but taking into account the lightweight portability, sturdy aluminum legs, and the presence of accessories, you really can’t do better than its affordable price. If you’re looking for something more reliable, you’ll need to shell out an extra bit of cash for a brand name tripod. Take a peek at our guide to the best tripods for smartphones. Dollar for dollar, this is about the best deal you can find on a tripod—at least one that you’ll actually trust to hold your camera. It’s hard to pin down competitors to the AmazonBasics tripod. There’s a 55-inch tripod from Zomei and a 7-inch tripod by Mountdog, both of which cost twice the amount of the AmazonBasics tripod. You’ll be very hard-pressed to find an option this cheap from the more top brands like Vanguard and Manfrotto. In other words, this really is the most affordable, solid tripod for the price. Need some more help finding what you're looking for? Read through our best tripods for DSLR cameras article. An affordable tripod for the hobbyist. Whether you’re just a hobby photographer, an at-home Youtuber, or someone looking to step up their photography, the AmazonBasics 60-inch tripod is unbeatable for the price. The build quality, while cheap, is perfectly serviceable for the average user. Product Dimensions 24.21 x 4.4 x 4.1 in.